Last week released two Hindi films Baadshaho and Shubh Mangal Saavdhan have completed their opening week on a good note at box office. Now both have been entered in the second week and showing decent performances despite having several new offerings in opposite, along with few existing ones. Milan Luthria’s directorial this action historical drama is based on gold heist set against the backdrop of 1975 during the time of Emergency in India. Starring superstar Ajay Devgn, Emraan Hashmi, Vidyut Jammwal, Ileana D’cruz, Esha Gupta and Sanjay Mishra in lead roles, Baadshaho received mixed reviews from critics but got succeed to entertain audience. After a strong opening, the film showed fair growth on the next day and registered the business of total 43.30 crores in the opening weekend. That included 12.60 crores of Friday, 15.60 crores of Saturday and 15.10 crores of Sunday from 2800 screens across the country. Then in weekdays despite getting usual drops in footfalls, Baadshaho remained steady and did the business of 6.82 crores on Monday, 6.12 crores of Tuesday, 4.30 crores on Wednesday and 3.60 crores on Thursday. After a week, total collection of the film was recorded as 64.14 crores. 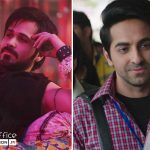 While on the other hand, Ayushmann Khurrana and Bhumi Pednekar starrer Shubh Mangal Saavdhan has also received mixed reviews from critics but audience found it much entertaining. In the opening weekend, it minted the amount of 14.46 crores with 2.71 crores on Friday, 5.56 crores on Saturday and 6.19 crores on Sunday. Then in weekdays it remained steady and raked 9.57 crores that included 2.53 crores on Monday, 2.85 crores on Tuesday, 2.12 crores on Wednesday and 2.07 crores on Thursday. After a week, total collection of Shubh Mangal Saavdhan was recorded as 24.03 crores. Now both the films have been entered in second week and passed the 2nd Friday on a decent note. The first one collected the amount of 2.10 crores and made it’s 8 days total 66.24 crores. While the latter one scored 1.54 crore to raise it’s total to 25.57 crores at domestic box office.